History: In honor of Josias R. King, the first Minnesotan to volunteer to fight for the Union in the Civil War, the Grand Army of the Republic commissioned this statue, which commemorates all the brave soldiers of the war. It cost $9,000. 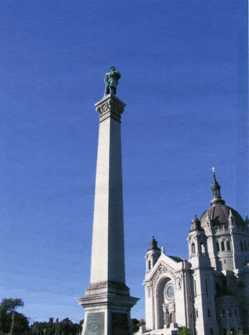 King died on February 11, 1916, in Saint Paul, thirteen years after the dedication of the monument. Daniels, a Norwegian-born sculptor in Saint Paul, has also created portraits of Senator Knute Nelson and Leif Erikson, as well as another Civil War monument in Arkansas. Dignitaries from both Minnesota and Arkansas (Governor J.A. Burnquist of Minnesota and General Christopher Andrews, commander of the Minnesota troops in Arkansas) attended the dedication ceremony for the latter on September 22, 1916. In 1901, he and his brother Hacon Daniels sculpted the dome of the Minnesota state capitol in butter. He won numerous awards and was decorated by the King of Norway.